Members ot the Security Council vote on the resolution. In the wake of an August chemical attack in Syria which a United Nations team later confirmed had killed hundreds of civilians, the Security Council on Friday called for the elimination of the country’s chemical weapons, while endorsing a diplomatic plan for Syrian-led negotiations toward peace. Defiance of the resolution, including unauthorized transfer of chemical weapons, or any use of chemical weapons by anyone in Syria, would bring about measures under the UN Charter’s binding Chapter VII, which can include sanctions or stronger coercive action, the Council said. The 15-member body added that it would work with the OPCW in deploying a chemical weapons “monitoring and destruction team” – expecting the full cooperation of the Syrian Government – and it appealed to UN Member States for support, including personnel, expertise, funding and equipment. It also authorized Member States to acquire, control, transport, transfer and destroy chemical weapons identified by the Director-General of the OPCW, in a way consistent with the Chemical Weapons Convention and the interest of non-proliferation. “Today’s historic resolution is the first hopeful news on Syria in a long time,” Secretary-General Ban Ki-moon told the Council following the adoption. “For many months, I have said that the confirmed use of chemical weapons in Syria would require a firm, united response. “Tonight, the international community has delivered,” he stated. Earlier today, Mr. Ban’s spokesperson said that the UN team led by Swedish scientist Åke Sellström has been able to resume its fact-finding activities related to all pending credible allegations of chemical weapons use, following its return to Syria this week. Those allegations include, he said, the 19 March incident at Khan al-Asal, reported first by Syria and subsequently by other Member States. As previously agreed with Syria, the other allegations to be investigated include the 13 April incident at Sheikh Maqsud, reported by the United States, and the 29 April incident at Saraqueb, reported by France and the United Kingdom. In addition, he said, the mission has continued to follow-up with the Government of Syria and to evaluate information it has provided on three additional allegations, including the incidents at Bahhariyeh on 22 August, at Jobar on 24 August, and at Sahnaya on 25 August. The team, assisted by experts from the World Health Organization (WHO) and the OPCW, visited the country last month and found “clear and convincing evidence” that Sarin gas was used in an incident that occurred on 21 August in the Ghouta area on the outskirts of Damascus in which hundreds of people were reportedly killed. Under the General Assembly-approved guidelines, the spokesperson recalled, the mission is obliged to evaluate all available information related to all allegations reported by Member States, for the purpose of preparing its final report. Also in today’s resolution, the Council endorsed a plan for a Syrian-led process, with participation of all parties, to end the conflict, which has claimed over 100,000 lives since it began in March 2011 and has led to over 2 million people fleeing the country, with some 4 million internally displaced. It also called for convening, as soon as possible, an international peace conference that is fully representative of the Syrian people. Speaking to reporters after the meeting, Mr. Ban said the aim is to hold the conference in mid-November. “The United Nations is ready to host Geneva II. It is time for the parties to focus on how to build the peaceful, democratic future Syria needs. All those with influence on the parties must use that influence now. It is crucial to keep up the momentum. 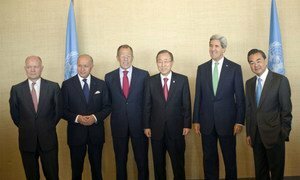 The ongoing crisis in Syria was the main focus of today’s talks at United Nations Headquarters between the foreign ministers of the five permanent members of the Security Council and Secretary-General Ban Ki-moon.